We are not alone . . . this message is fundamental to our faith and our life path. Remembering that we have been gifted with the presence of Jesus, God the Father, the Holy Spirit, Mary, the Apostles, and numerous saints is a comfort and a strength we can tap into always. We literally have a multitude of gracious and powerful supporters who accompany us at all times. Jesus and the Apostles built an example we can still learn from of the challenges and joys of accompaniment. The journey they took together had difficulties similar to those we sometimes have with our own close friends: broken trust, anger, fear, vulnerability. Equally or even more so, though, their circle was filled with admiration, perseverance in the struggles to understand both details and bigger pictures, laughter, and breaking bread. We learn from them about the choice, the volition involved in faithful accompaniment of others, and how this choice is an expression of love. 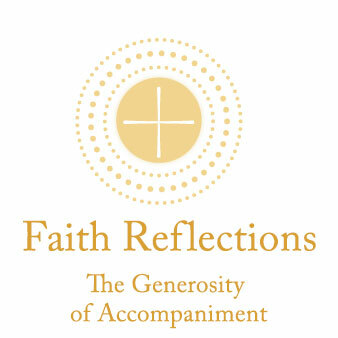 The generosity of accompaniment works on many levels—it's a focus that is reciprocal, a selfless caring that ensures things don’t get one-sided for very long, and a willingness to be vulnerable in the rigorousness of our honesty. These principles guide our relationships and prayers—with God the Father, Jesus, the Holy Spirit, Mary, and our multitude of saints in heaven—giving us the opportunity every day to discover and rediscover and experience the strength in the reciprocity of love with them. It might seem as though we couldn’t possibly give anything to God, the saints, or the Holy Spirit that could compare to all that they give us, but they have let us know that is their invitation to us. When we give, we receive. Our prayer, our awareness of them and their gifts to us, our efforts to live faithful and reflective lives—these are the generous ways we give in our relationships with our circle of spiritual supporters, and in turn we receive a deeply strengthening of our faith and an increasing optimism as we are embraced by hope and love. We are truly never alone.